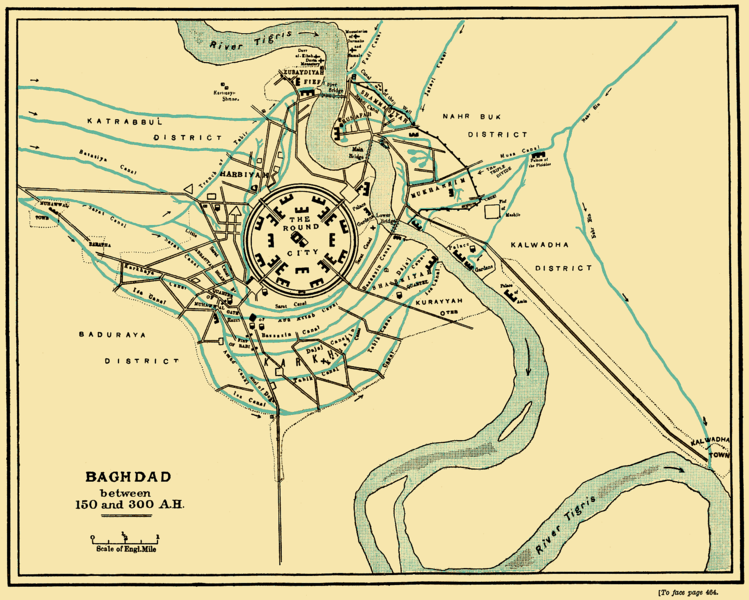 Astrogeographical position of Baghdad for morphogenetic field level 1 which defines the supraregional, international situation and role of the capital and government of Iraq: The capital of iraq is located at 10° Capricorn and 22° Cancer. The transits of the planets in relation to Baghdad`s astrogeographical coordinates from the time of the development that led to the 2nd Gulf War between 2 August 1990 – 28 February 1991 deliver a full astrological proof for these astrogeographical correspondences in relation to Iraq. 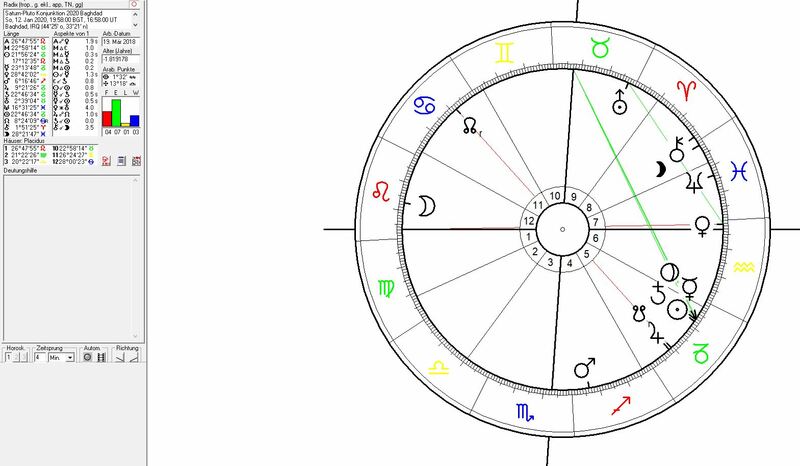 Astrological chart for the independence of Iraq calculated for October 3 1932 at 13:30 at Baghdad. The event that led to the final independence of Iraq was the Union of Nations vote over the country`s admission at 11:30 at Geneva (Switzerland). Data source: Nicholas Campion. The independence of Iraq became effective with Pluto at 23°Cancer exactly conjunct one of the two astrogeographical coordinates of Baghdad, Pluto stood for the process of transformation, restructuring and redefinition of the society and national identity. At the same time Uranus in exact square from 21°Aries exerted the strongest demand for social and political change onto the society. The Sun at 10°Libra was in exact square revealing the intense challenge to the government. 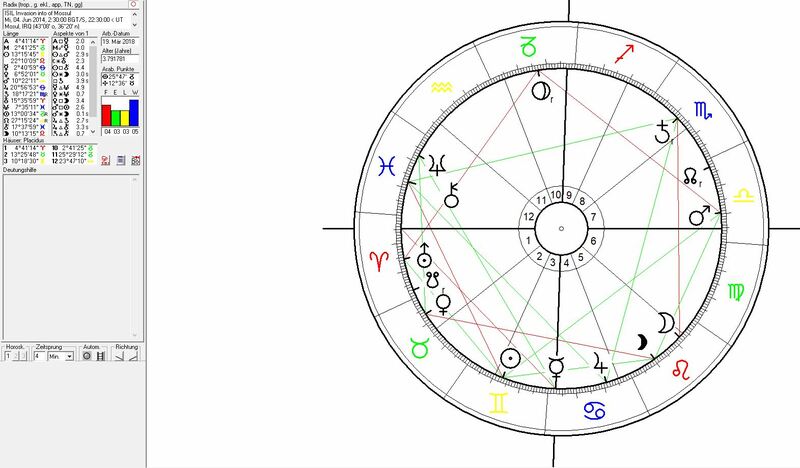 The chart already contained the position of Mars at 7°Leo in House 7 a constellation of hostility on the astrogeographical resonance degree of Saudi Arabian capital Riyadh Iraq´s most important and most powerful enemy. The Saturn – Neptune conjuction at 10°Capricorn and conjunct Bagdad during the Fall of the Berlin Wall on November, 9 1989 indicated a major depression for the Iraqi capital and government because the support from its major ally Russia broke down through the Russian peace politics under Gorbachev that ended the First Cold War. Neptune was still conjunct the 10°Capricorn astrogeographical resonance coordinate of Baghdad when Saddam Hussein´s armies invaded Kuwait on August, 2 1990. Uranus the god and planet of the sky, flying and airplanes,followed Neptune to conjunct Bagdad during the air strikes on the city by the international alliance from January 17 1991. The Neptune conjunction during that attack strongly resembled the attacks of fascist Germany on Russia in June 1941 (Operation Barbarossa) and of Japan on the USA in December 1941 (Pearl Harbour). Neptune stood for the illusion of winning a war against a superior enemy, the paralysis of the population and opposition under an extremely strong dictatorship, the blindness of the government and the self-destruction of the attacking country as a consequence of the invasion under a Neptune conjunction with its capital. Uranus went conjunct Baghdad`s 10° Capricorn coordinate between April 1990 and January 1991 explaining the war as a projection of the country`s interior problems and the governments fear to be overturned onto other countries. Neptune at 11° Capricorn was conjunct Baghdad´s position for 8 weeks in September and October 1990 in a typical constellation of paralysis of the population and a constellation before defeat. During the foundation of the international alliance in early December 1990 Saturn was at 22° Capricorn in exact transit over the opposition degree of the astrogeographical position of Baghdad at 22° Cancer . Saturns typical role was to stop the unhindered expansion of Iraq that had been begun through the invasion of Kuwait of August 1990. Interestingly none of the outer planets was in clear transit of the astrogeographical resonance coordinates of Bahgdad at the time of the beginning of the illegitimate attack on Iraq by the Bush administration in March 2003. This can be judged as a clear indication that the cause for this war did not lie in Iraq itself. The country was rather a victim of the US – Saudi alliance`s strategical policies aimed at destroying the stability of the regime, its administration and splitting the country into several single states. 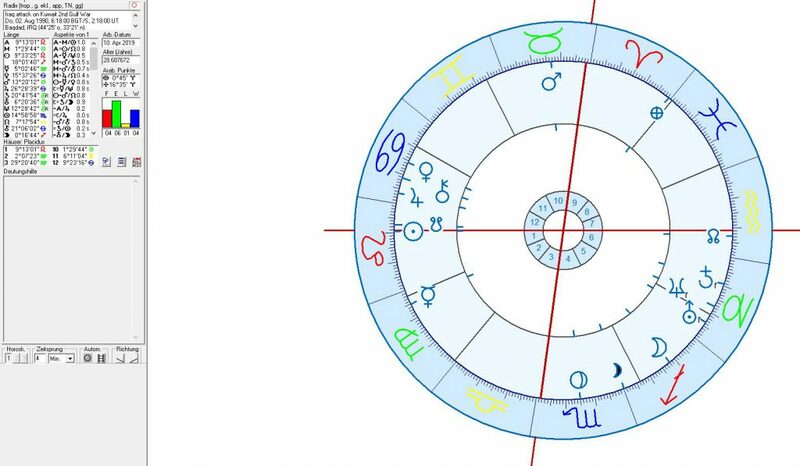 This can be judged from the conjunction of Venus with Neptune the constellation of territorial destabilization in house 1 and the position of Uranus at 0°Pisces in a constellation of factual chaos in house 2 the house of possession of territory. The US attack overturned the government and compeletely destroyed Iraqi administrational, political, police and military structures. 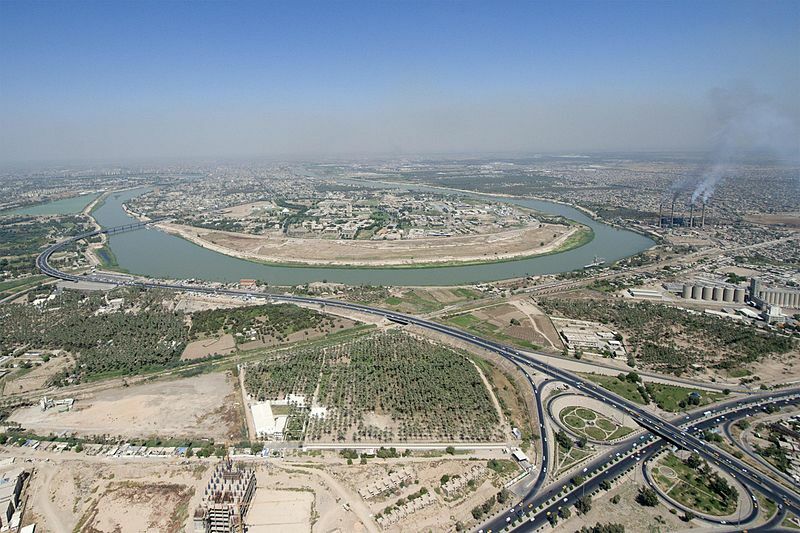 It was carried outwith Mars at 10° Capricorn the sign of governments, administration and stability in exact transit of the astrogeographical position of Baghdad on March, 20 2003. Jupiter the planet of victory, success and profit orientation was at 8°Leo exactly conjunct the astrogeographical position of the Saudi Arabian government at Riyadh. The capture of Baghdad effectively started a period of global strategical US politics that made Saudi – Arabia the No 1 strategical US ally worldwide. 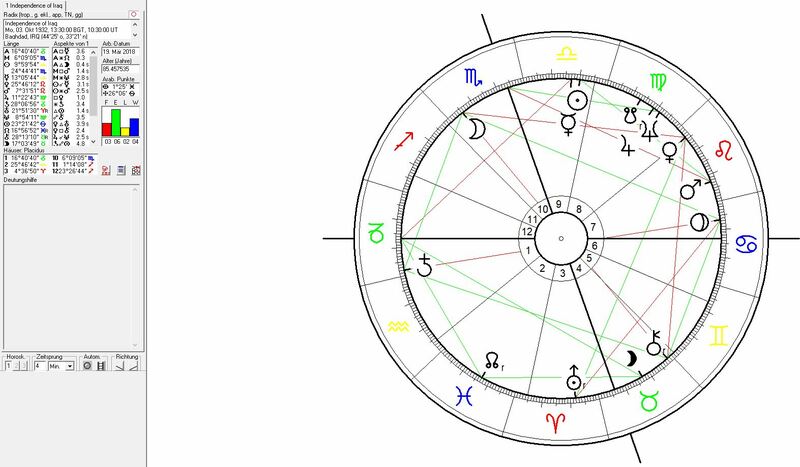 The transit of Pluto conjunct the astrogeographical position of Baghdad at 10° Capricorn between January 2012 and january 2015 accompanied a period of heaviest and traumatic threats to the independence of Iraq and the Iraqi government. The climax of this process was reached in early 2014 during ISIL`s Western Iraq offensive that led to devastating military losses of Iraqi government forces as they were driven out of key cities in Western Iraq. Pluto`s astrological definition as the planetof trauma, pain, self defense, death, the underworld and the battle for hierarchy and power under the disguise of pseudoreligious ideology, fascistoid dogma, patterns of role conduct and the destruction of religion was definitely fullfilled during the spreading of ISIL terror over a destabilized Iraq. The conjunction of Jupiter at 21° Cancer the sign of feeling at home, personal and national identity with Baghdad during the capture of Mossul may indicate that the loss of Mossul had a highly supportive and long term positive and stabilizing effect on the acceptance of the new central government as the only institution that could fight back the pseudo-islamic neofascist terror regime installed in Mossul by the Saudi-US coalition. Uranus` transit over the 22°Aries square position to Baghdad took place between May 2015 and April 2017. It brought the heaviest threats to the authority of Iraqi government through the rise of ISIL and later finally also through the victories of the kurdish armies and their claim for autonomy. 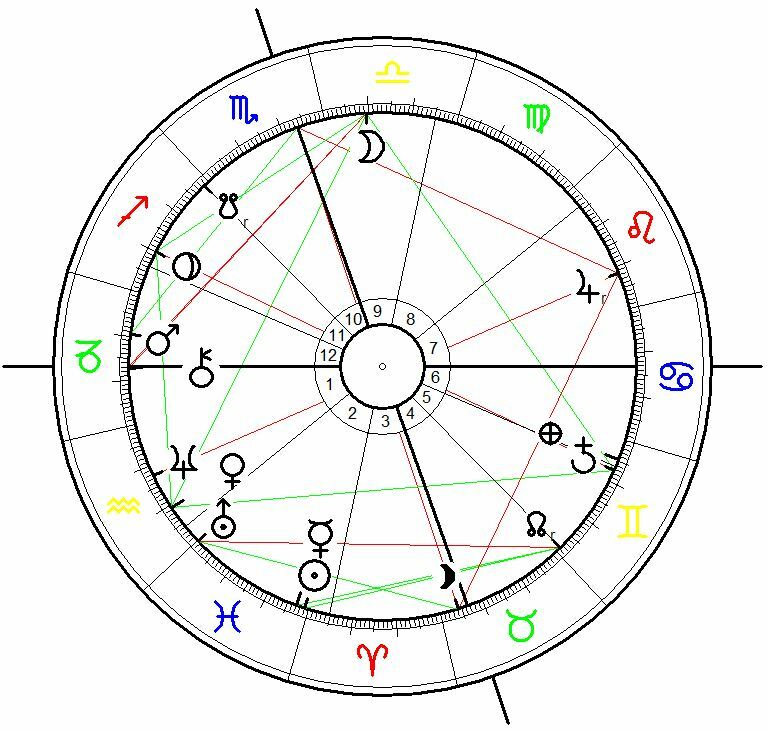 The climax of Pluto`s transit in opposition to Baghdad between March 2018 and January 2021 will be reached through the Saturn-Pluto-Sun-Mercury conjunction of 12 january 2020 around 22°Capricorn. 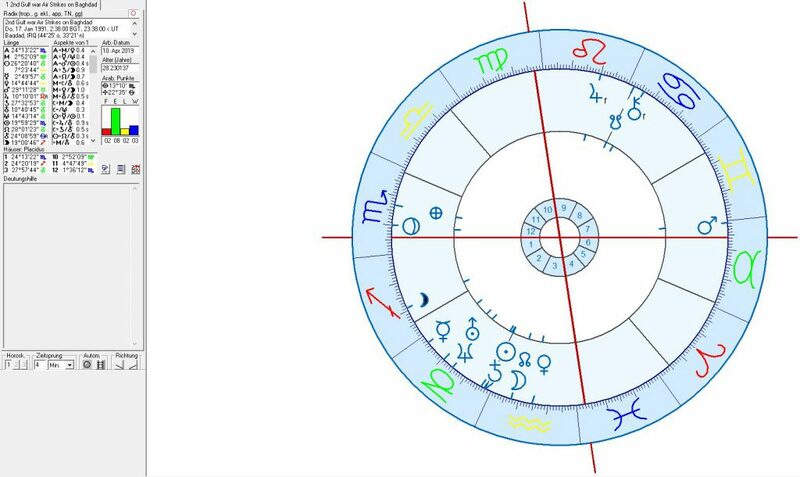 As Jupiter will be conjunct the 10°Capricorn position of Baghdad at the same time the extreme challenge exerted by this super opposition can be expected to have a long term stabilizing effect on the Iraqi government and the reconstruction of the country´s infrastructure and the autonomy of its government. There are several reasons for this conclusion. A Jupiter as the planet of victory will transit Capricorn the sign of governments, administration, stability and hierarchy indicating a period of stabilization of the country and government..
B as the planet of healing Jupiter will contact and help in solving the topics of the Saturn -Neptune conjunction of 13 November 1989 which through the dissolution of the Soviet Union and the loss of Iraqs most important ally had triggered the Iraqi depression and the loss of the country`s autonomy in 1991.